About Us - Northwoods Canoe Co. The above picture is the celebration of the 1000th canoe to come out of the shop. The people in the canoe are all of the company’s full- and part-time staff, my wife Andrea and the two new owners of the custom Atkinson Traveler. The company is located in the little village of Atkinson, Maine, in the geographic center of the state. I have been developing hand-crafted wooden boats here for almost 40 years. 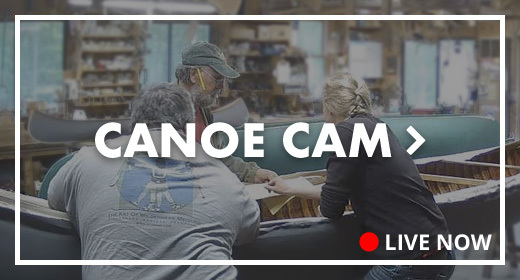 The company specializes in wood and canvas canoe construction and restoration services, and offers canoe building classes, canoe kits, and parts. In the mid-1970s, a long interest in canoeing led both Jerry Stelmok and me to attend the Maine State Vocational two-year Wooden Boat Building School in coastal Lubec, Maine. There, we became partners in the Island Falls Canoe Co. in 1976. After a couple of years, we moved the company inland to Atkinson. Due to the lack of business or maybe the lack of our business skill, we had to dissolve the partnership in 1982. We both kept active with part-time canoe building/restoration work and by 1986 we had both become busy enough to be full-time builders once again, this time in separate shops. During our struggles to maintain a wooden canoe company it became painfully clear to us that there was only a pitiful amount of recorded wooden canoe history or books on building techniques. The old canoe companies were dead and the canoes produced by the occasional backyard builders were mostly of questionable quality. We were always having to reinvent the wheel, to dissect old canoe company catalogs and pictures to figure out what techniques they were using. This led us to co-author the book “The Wood and Canvas Canoe.” It was the first book ever to explain, in detail, how a wood and canvas canoe was built. I included a lot of original research, never before published, on the old historic Maine canoe companies. In addition, I designed three canoes to have their plans included in the book. The book became an instant best seller (in the wooden canoe world) and is now referred to as the “Bible” of wooden canoe building. It has not been out of print since it first edition in 1988. The 17.5′ Atkinson Traveler that I designed for the book has also become a classic wilderness tripping canoe. I started the Northwoods Canoe Company in 1984, specializing in the restoration of wooden boats and canoes. I was building the three canoe designs that I had published in the book and over the years added more original designs. I also added reproductions of historic canoes that I admired. Many of the quality canoe-building materials needed for the canoes were no longer available, so I custom-ordered, or produced myself, the materials such as the clinching iron, the small #15 bronze ring nails, the 3/16″ bronze carriage bolts, the mildew resistant canvas, the planking gauge, and the 3/8″ brass stem bands. Today, these items are standard in every canoe shop. While I have worked on every canoe in the shop, I have been very lucky to have some quality people join me, some for full-time and some for part-time work. They have all helped build the shop into one of the premier small wooden canoe shops in the world. We all love to do quality work, to help our mail order customers with their own projects, and to help students build their own canoes. Starting and building any small company is a struggle. I am lucky that I have had great support along the way. My wife Andrea has never worked in the shop, however her unwavering support and faith in me, even when times were very hard, has made it possible for me to grow the shop into one of the premier wooden canoe companies.